Let’s face it; baby monitors have come a long way over the last few years. What started out as being a device with colored bars which light up to sound and movement have now transformed into full-HD, real-time video and audio systems. Technology is amazing, and it’s allowed us as parent to look after our children in a way that was never before possible. One type of these new-age baby monitors is known as a breathing monitor, and is perfect for reducing a parent’s stress when it comes to irregular baby breathing during the day and throughout the nights. With so many breathing monitors to choose from, I found it slightly overwhelming trying to find the one that was right for me. To help you narrow down your search, I’ve chosen five of my favorites. My all-time favorite breathing monitor has to be this one from Sense-U. This is easily one of the most innovative and modern-day monitors I’ve ever seen. What’s surprising is just how small and lightweight this monitor is. You simply clip it onto your baby’s diaper while they’re asleep. Then, the ultra-sensitive sensors inside the device will monitor your baby’s breathing by tracking their body movements. This means you’ll be able to accurately track your baby’s sleeping position and their overall well-being, without having to even be in the room. All the data from the monitor is wirelessly sent to your smartphone and is readable through the free Sense-U app, which is available for both Android and Apple devices. Wireless devices strapped to your baby? I know, it doesn’t sound safe at all. However, the device uses an extremely low-energy Bluetooth transmitter which has almost zero radiation. It’s below 1/1000 of a cell and has a range of around 50 feet. So even if you drop out of range, your phone will tell you and will automatically reconnect when in range. What's Great About It: I simply love just how easy to use this monitor is. The app is designed to be clean and tidy, and displays all of the information you need to know, including sleeping position and heart rate. If no movement is detected for 15 seconds, or your baby’s heart rate becomes abnormal, the app will let you know instantly using a loud, clear tone. If you don’t like the idea of a wireless transmitter on your baby, don’t worry. Despite them being safe, there are plenty of other options available. Take the Babysense Hisense 5s for example. This highly sensitive monitor connects to sensor pads which can be placed underneath your baby’s mattress or crib. That means there’s absolutely no contact with your baby. 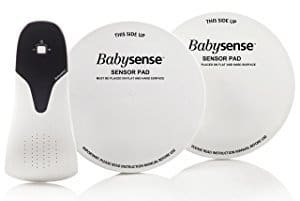 These sensor pads are incredibly sensitive and can pick up even the tiniest and most minute movements that your baby makes, including normal breathing. Each set comes with two sensor pads that work together which, in turn, connect to the main unit using a wire. If no movement is detected by the pads for more than 20 seconds, or if your baby’s movement level drops below ten ‘micro-movements’, or breathing movements, per minute, the control device will notify you immediately. This gives you more than enough time to check on your baby to make sure that they’re okay. For complete peace of mind, there’s a green light for every movement your baby makes, a low-battery indicator light and a clear alarm, and red light when there’s no movement. What's Great About It: To make sure your baby is completely safe and doesn’t get caught up in the wires of the device, you can simply hang the control device underneath the crib, meaning there are no wires needed in the space where your baby sleeps. This awesome little monitor combines all the best bits of a monitor into one complete device, saving you a lot of money as you don’t have to buy multiple devices. With this set, you’ll find an under the mattress sensor which, of course, is highly sensitive and can detect even the tiniest movements that your baby makes. If no movement is detected for 20 seconds, the monitor will sound an audible alarm so you can check on your little one. However, to bring a new angle to baby monitoring, this device also provides you with a crystal-clear, full-HD and color display. This is so that you can keep a watchful eye of your bundle of joy while they sleep, ensuring that there are no problems. This monitor works during the day and night thanks to the automatic infrared mode, so you can still see exactly what’s going on without having to disturb your baby. There’s nothing worse than your baby waking up when you switch the light on and trying to get them back to sleep. What's Great About It: To make things even easier for us, the control device on this monitor has a full touchscreen interface. That makes it incredibly easy to control, and any parent will be able to pick up how to use it in seconds. That makes looking after your baby while they sleep even easier. 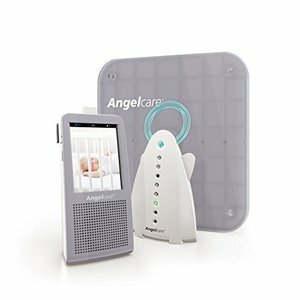 This baby monitor with sensor pads is great, and it works really well, but I personally prefer the clip-on monitors, simply because they are so accurate. Therefore, I love the Snuza Hero. This tiny, lightweight, and unobtrusive device can easily be clipped onto your baby’s diaper for detecting even the tiniest of movements. Unlike cheaper breathing monitors, this one is extremely accurate. This is because it will give you comprehensive feedback if anything’s wrong. If no normal movement is detected within the space of 15 seconds, the device will vibrate, notifying you of what’s going on. In most cases, the vibration is normally enough to rouse your baby gently, ensuring they return to a normal breathing pattern. If no movement is detected after an extra five seconds, the device will notify you using a loud and crystal-clear alarm. These settings make this one of the most proactive monitors available. It’s no wonder why this is one of the most popular devices around. What's Great About It: There is no control base or handset that comes with this monitor; it’s just the clip-on device. This means there’s no risk of wireless radiation, no cords or wires or anything that could otherwise harm your baby’s well-being, making it incredibly safe to use. As you can see from some of these other monitors, they’re rather large, and you may be thinking that you want something a little smaller. With the recently updated MonBaby Monitor, all the monitoring power we want has been condensed into a tiny little button. This button can be easily clipped onto your baby’s clothes and any age, meaning your children can never outgrow it. The button is sensitive enough to pick up all the tiny movements, relaying all the information back to the dedicated app on your smartphone. The app is compatible with a full range of Android and Apple devices, but your device will need working Bluetooth for it to connect to the monitor. All the data shows up on the easy-to-use app screen and will notify you if any changes in breathing or warnings arise. This means you can sleep peacefully and only need to wake up if needed. 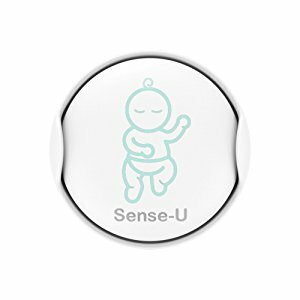 What's Great About It: With your baby’s well-being in mind, this button uses ultra-low Bluetooth energy technology that produces almost zero radiation. This uses far less energy and power than traditional Bluetooth devices, meaning you can enjoy a full-length battery life. Baby monitors have so many different features and purposes that it can easily become overwhelming and stressful trying to make a decision. To make things easier, here are a few features you need to look for. There’s no point in paying out for a cheap baby monitor that’s not going to be sensitive enough to pick up your baby’s movements. It’s always worth paying that little bit extra for quality. The reality is that it could mean your baby’s life. You’ll want a baby monitor that’s easy to use, so that there’s no fuss when you’re trying to use it. If your chosen device uses an app, you’ll want to check that the app is easy to use so you can focus on what’s most important. Your baby may be sleeping while you’re going about your day. With this in mind, you’ll want a monitor that has the range so it will still work as you go about your day. Consider the size of your house and check the wireless range of your preferred monitor. Choosing a baby monitor that’s right for you doesn’t have to be a daunting task. Take your time and consider what you want from your baby monitor and it will be so much easier to make the right decision.